Why have Manchester United allowed themselves to be embarrassed by Fellaini? Manchester United midfielder Marouane Fellaini and manager Jose Mourinho. Manchester United midfielder Marouane Fellaini looks set to leave the club this summer after rejecting the Red Devils’ latest offer, but why has this saga been allowed to go on and on? The Belgian international spent the majority of last season on the periphery and has no long-term future at Old Trafford given the stiff competition in midfield, but manager Jose Mourinho just wouldn’t let Fellaini go. While a useful player from the bench at times, the 30-year-old’s impact has been considerably oversold and United are ultimately better off without him. Fellaini forces the Red Devils to dramatically alter their playing style to more direct which isn’t easy on the eye and doesn’t suit a lot of the creative players. Nevertheless, Mourinho desperately fought to keep Fellaini and has embarrassed himself and the club by trying and failing. The Belgian midfielder has a reputation for being an impact substitute who can score goals and create chances for his teammates due to his physical presence. Fellaini towers over most players, meaning he wins the majority of aerial duels and is strong enough to hold the ball up and bring others into play. However, he barely contributed last season, scoring just one goal in the Premier League since September, so why does he still get so much credit? Fellaini scored only one goal in the Champions League and FA Cup combined, but still Mourinho went public about his desire to keep the former Everton man at Old Trafford. For many, the 30-year-old is one of many problems gulfing the squad. His inability to provide good off-the-ball movement or composure in possession means United are limited with him on the pitch. He’s strong but isn’t known for being a good tackle, passer or creator, so what does he bring to the side? If Fellaini isn’t scoring, he’s a hindrance rather than a help in games and has been at United longer than anyone would have expected. Joining from Everton in 2013, the midfielder has gone on to make 156 appearances in all competitions, winning one Europa League, one FA Cup and one League Cup in five years. Why does Mourinho want to keep him? Those who have seen Fellaini up close wouldn’t be too bothered by him running down his contract and leaving on a free transfer this summer, but Mourinho has been irked by it all. Rather than let the midfielder leave and identify a player who better fits the squad dynamic in the summer transfer market, he’s been public in his pursuit of tying Fellaini down to a new deal. To be so determined to retain the services of a player who has contributed little in the last 12 months is odd. 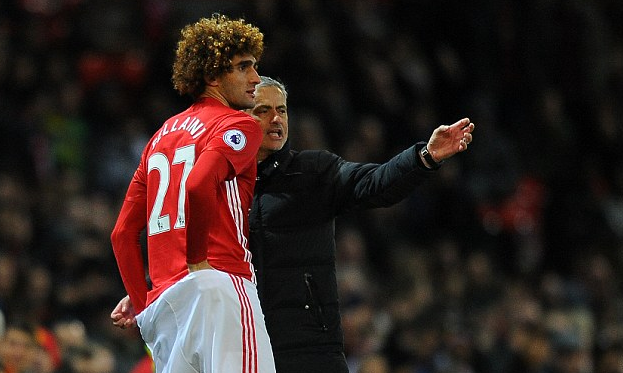 Fellaini divides supporters, but ultimately Mourinho’s treatment of him last season highlights where he sits in the pecking order. The midfielder made just five Premier League starts and found himself behind Paul Pogba, Nemanja Matic and Ander Herrera. He’s used sparingly by his own manager, so why the effort to keep him? Is Fellaini really going the difference between success and failure?